A pre-production samples is systematic testing process to ensure the what will be quality, suitability, dimensions and tolerances of product during the manufacturing process. Normally this process is widely use in garment manufacturing units. Pre-production samples process is quality inspection tasks that conduct by quality assurance team. The pre-production samples process manage to verify the raw materials quality by inspecting before the raw materials load in regular tasks that is at production lines. The sampling process is establish to verify the product quality and suitability for the manufacturing various processes. Finish product requirements, machinery parameters and other supporting processes are consider to run the raw materials on live production. That should be properly verify and assure to load materials will be provide good quality product on completion of manufacturing job tasks. As per end application requirements as expecting by quality team at the movement of sample verification at pre-production sampling plan. Pre-production samples process is manage as per product, product sizes and its specifications, standards & customer requirements. As random or hundred percent requirements, the materials are manage in sampling plan to select by randomly. To ensure the product quality, and on average results are verify by quality assurance team. It may help to determine for further steps that is loading the materials at production lines or hold the materials to not move without any clarification, issues are not resolve. Pre-production sample process is establish by quality assurance team. To communicate with quality controls inspectors to manage the join tasks that needs to verification of materials to avoiding materials defects during in-process. On final inspection rejections, the team is verify the materials as require standards and internal system to compare the machinery, equipment and resources are dedicate for production lines. To ensure the product quality will be provides on completion of manufacturing job. As well as maintain sustainability during the in-process activities as customer requirements of product specification targets. Special characteristics and close tolerances. During the pre-production process. Quality team is most consider customer specific requirements and end applications requirements are match. To ensure the product deliver to customer will comply all expect quality testing. The pre-production sample inspection process is conduct that needs to manage all the concern activities in the record format. It makes easier for evident the further reporting to concern peoples. So the quality team is prepare the records in pre-production sample log. 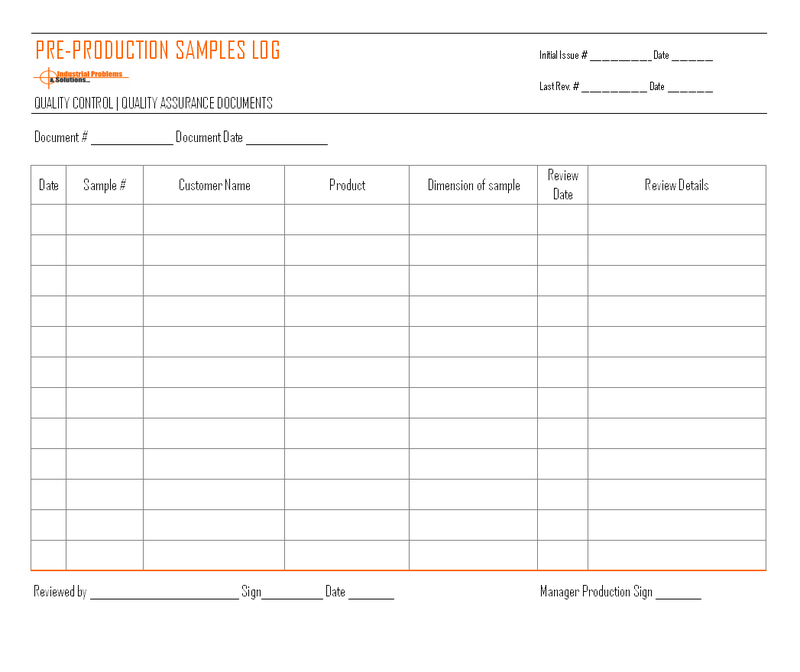 The pre-production sample log format is use to recording information inspection process handle by quality team. To ensure the raw materials load in the production line will be comply the requirements of end application and standards on as finish. The material inspection is manage before production load to ensure the quality of raw materials. This document is use to record information of each activity conduct for sample inspection of the materials at raw materials. The records are manage to considering customer requirements. Hence the detail information are fill in the log file and on completion of inspection process the documents are fill quality inspectors and provides to quality manager for further reviews & implementation.